Blogging has been light for the past week because I´m away from home (and for the previous week because I was preparing to be away). 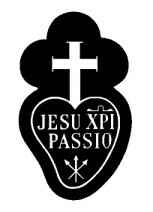 I´m visiting the Passionists at Pasing, just outside Munich, giving the Passionists in Glasgow a rest. Saint Gabriel´s Retreat, Pasing, is a small retreat house and is also the residence of the Provincial, Father Gregor Lenzen c.p. They don´t have a website yet, so I can´t link you to it. However, encouraged by Father Gary´s recent visit, I have started taking digital photographs again and hope to let you see some of them when I return to my own community. During the week, Father Gregor took me to Altötting. I had never been there before and really enjoyed the visit. I was very impressed by the devotion of the pilgrims, including a number of young people. It´s a real centre of faith, and is traditionally known as The Heart of Bavaria. 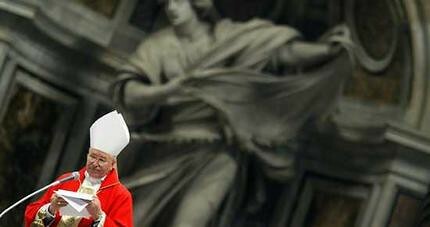 The Pope will be going there in September. Photographs and more information to follow! The Passionists here belong to the Bavarian-Austrian Vice-Province of the Five Wounds. Vice-Province means that there are too few of them to constitute a real province; they are only about fifteen members, but the majority are under sixty. They had a new priest ordained a few weeks ago and had another ordination last year. 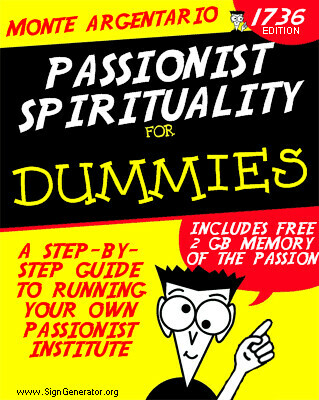 A new novice will receive the Passionist habit (minus the Sign, which is given at profession) in a few weeks time. So, although their numbers are small, they have probably the lowest average age of any of our provinces in northern Europe. In my own community I am the youngest, but everyone here (including the Provincial) is younger than me – so I´m feeling quite old at the moment! For many years now, this Vice-Province has committed itself quite strongly to community prayer, with daily meditation in common as well as the Office, and to promoting our Passionist Spirituality, through emphasising the teaching of Saint Paul of the Cross and the lives of the Passionist Saints – it seems like a good recipe for survival in difficult times. HT to Ray from MN. 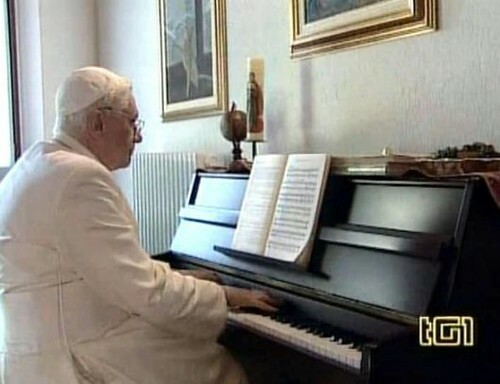 I don’t usually copy news items, but this must rank as the best papal holiday snap I’ve ever seen, although I suspect an even more splendid holiday picture will be seen by BXVI during the “villeggiatura”. In “A Traveller in Rome”, H.V. Morton writes about his visit to Castlegandolfo where he saw a painting of a hunting scene with the Franciscan Pope Clement XIV on horseback and wearing a white hunting coat and britches. –That’s one I would love to see. Hat tip to Amy; photo at La Repubblica. Today Father Gary has a post at The Passionist Charism on Saint Paul of the Cross’s brother, Antonio Danei, whose anniversary of ordination is tomorrow. Antonio was the first witness to be called at the Ordinary Process for the Beatification and Canonisation of Paul of the Cross held in Alessandria in July 1777, less than two years after Paul’s death. Antonio was only ten years old when his brother Paul embarked on his new way of life after receiving the black habit of a penitent-hermit from Bishop Gattinara of Alessandria. At the time of the Canonisation Processes, Antonio was sixty-seven years old. He describes himself as a secular priest and poor ecclesiastic. In his testimony he describes how one day, while he was living with Paul on Monte Argentario, he went into Paul’s room when Paul wasn’t there and, out of curiosity, he opened a drawer in which he found a book covered in parchment and bound with thread. When he opened it, he discovered that it was a manuscript written in Paul’s own hand. He began to read it. In the book Paul described how, coming one day from the Capuchin church (in Castellazo), after having received communion, as he was returning home along a street called de’ Corazza, he saw himself in spirit clothed in a black robe with a white cross on the breast, under which was the name of Jesus, and he heard these words: This is a sign of how pure that heart must be which must carry the most holy name of Jesus graven upon it. Antonio concludes the story by saying: In reading this, I was completely filled with feelings of tenderness, and I could not hold back the tears; however, I read no further for fear of being surprised there by Father Paul (Processi, II, 10). Antonio’s recollection about forty years after he read the text bears an amazing similarity to Paul’s own account of the experience in the Preface to the Rule. Today the Vatican Information Service announced the retirement of Archbishop Piergiorgio Silvano Nesti C.P., Secretary of the Congregation for Institutes of Consecrated Life and Societies of Apostolic Life. Archbishop Nesti (shown here celebrating one of the Novendiales Masses after the death of Pope John Paul II) has been Secretary of the former Congregation for Religious since 1996, having spent the previous three years as Archbishop of Camerino San Severino Marche, a diocese well known to readers of any reliable biography of Saint Paul of the Cross as a place where Paul preached missions and retreats. Before becoming a bishop, Monsignor Nesti lived for many years at the monastery of Saints John and Paul, the Passionist Generalate in Rome, where he was Rector for some time and where he later worked as Secretary of CIPI, the inter-provincial conference of Passionists in Italy. He was Secretary General (and later either President or Vice-President) of FIES, the Italian federation of retreat houses. During his years at Saints John and Paul, he also worked with other religious communities, particularly Mother Tecla and the Bridgettines (le Brigidine). He was at Saints John and Paul when I lived there in the 1980s and was one of four members of the community at that time to be raised later to the episcopate. For the last two and a half years, he has been my line manager in the work I have been doing as Pontifical Delegate to the Passionist Contemplative Nuns in Italy. He followed the development of the new Federation for the Nuns very closely and was always very fraternal and welcoming; I was able to meet with him at short notice whenever the need arose. I hope he has a happy retirement, but I am sure he will keep himself busy, perhaps with retreat ministry, to which he was always very committed.